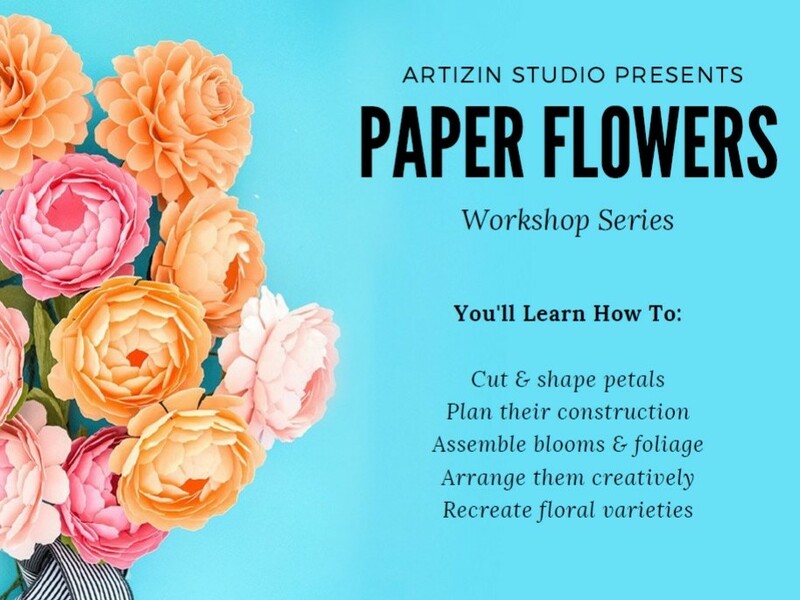 Learn the basic skills of sculpting paper into beautiful flowers that look freshly picked from your garden. 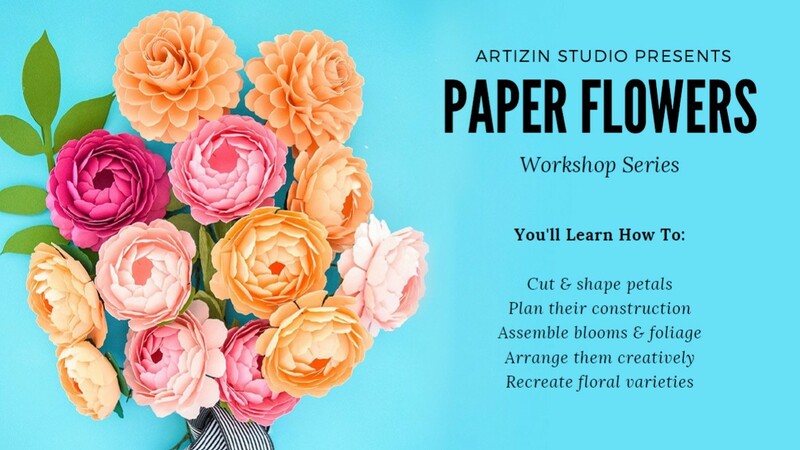 Using colorful card paper, you will work step-by-step to create a variety of paper blooms perfect for a lasting bit of decor to brighten any home, work, or special event. All equipment, supplies, and instruction will be provided. You will leave the class with the understanding of how to cut and shape petals, plan their construction, and the final finishing needed to recreate additional popular floral varieties at home, such as roses, zinnia, chrysanthemum, daisies, and dahlias. Suitable for all abilities as step by step instruction given so the project is easily achievable at each person's individual level. Artizin Studio is a place where you'll feel rejuvenated and inspired to create. Please take a look at all the different options that we are offering. We hope to see you soon! Purchase the Workshop Bundle and SAVE! Indulge your craft addiction while getting a discount that you truly deserve! Save up to 25% by signing up for all three workshops... and that's not all!! Have a crafty good time with your friends by signing them up too! Each of you will receive a 15% discount on your purchase of craft supplies and creativity kits during the workshop! All sales are final. No refund or exchange available. We offer off-site private and corporate workshops for our paper flowers, big flowers, paper succulents, paper terrariums and paper wreaths . Offsite workshops are a great way to celebrate birthdays, bridal showers, baby showers, get-together and corporate events. We provide all materials which include creativity kit, scissors, glue and how-to instructions to take home for practice. We ask for a minimum of 10 people and can accommodate up to 30 people per batch. We travel within Mumbai, Pune and beyond, and travel fees will be applied depending on the location. We also offer one-on-one personalized workshops for individuals who are interested in mastering the flower making skills along with business consultations in how to make a living out of making and selling your crafts. Contact us at +91 97300-77168 for more info or questions.